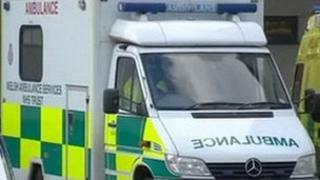 More details have emerged about plans to open a £2.7m ambulance depot covering Flintshire. Based at the former Dobshill hospital, Buckley, it will house ambulances based at stations in Mold, Holywell, Flint and Queensferry which are due to close. Paramedics will collect their vehicles at the start of their shift at the new depot before taking up position at as yet undecided deployment points. It is understood these will be in areas similar to stations due to shut. However, the plan is for paramedics to share facilities at deployment sites with other public organisations such as the police and fire service, although details have yet to be confirmed. The former hospital site has been transferred from Betsi Cadwaladr University Health Board to the Welsh Ambulance Service to serve as the new home of the Make Ready Depot (MRD). It will include facilities for the routine and deep cleaning and restocking of vehicles. A Welsh government statement said the new depot will allow the ambulance service to "condense premises that are not fit for purpose, either because they are in a poor state of repair, or in the wrong location". A number of fleet assistant jobs will be created in the move. Their role will be to clean, maintain and restock the vehicles, a job currently carried out by paramedics in a move giving them more time to work in a medical capacity. Health Minister Lesley Griffiths has given the go ahead for the funding. "One of the ambulance service's objectives is to provide the right service with the right care in the right place and at the right time with the right skills," she said. "This Make Ready Depot is a big step in the right direction." A Welsh Ambulance Service spokesperson said: "Our discussions will continue with local communities and partners in the Flintshire area to assure them of the benefits the MRD will bring."